The proposition here is that antisemitism is not equivalent to antipathy towards Jews (though it may be expressed as such) it is a ‘certain perception of Jews’ but that perception is not described and therefore has no gives no information and therefore cannot define anything. To take just one of these examples: “Denying the Jewish people their right to self-determination, e.g., by claiming that the existence of a State of Israel is a racist endeavor.” This is problematic because it could be taken to deny expression of a legitimate interpretation that the founding of the state of Israel, by priveliging one ethnic group over another and through its implementation was a racist endeavour. It could also be taken to deny expression of the thought that the current policies and practices of the state of Israel are racist. It might be argued that the wording does not deny these expressions as it concerns itself with the existence of the State of Israel not with its founding or its policies and practices but what expression does it then deny? Mere existence cannot be said to be an endeavour at all let alone a ‘racist endeavour’; existence is a precondition to any endeavour. Phrasing such as this can be taken to mean very little or very much. It is correct to say that the definition with its examples is not fit for purpose if that purpose is sanctioning antisemitic racism while protecting the right to speak freely against oppression and injustice wherever and by whomever it is perpetrated. It is the right of any autonymous organisation or community to determine how, subject to national laws, it is governed internally. It is the duty of such organisations to apply due diligence to the adoption of guidelines. To abrogate that responsibility to outside bodies would be a dereliction of duty on the part of elected officers. More than 40 Labour MPs formed a human shield around their Jewish colleague Ruth Smeeth this morning as she arrived at a disciplinary hearing of an activist accused of being anti-Semitic towards her. Flanked by dozens of her colleagues, Ms Smeeth, an outspoken campaigner against anti-Jewish hatred in the Labour Party, was heckled by far-left activists demonstrating outside the hearing in Westminster. She was due to give evidence against Marc Wadsworth, a Jeremy Corbyn supporter who is alleged to have accused her of colluding with the media during a press conference on anti-Semitism two years ago. The exchange, which took place at the launch of Labour’s Chakrabarti report, resulted in Ms Smeeth breaking down in tears. Mr Wadsworth was condemned afterwards by Baroness Chakrabarti, who said he had behaved “incredibly rudely”. He was later suspended pending investigation. As Smeeth walks out (from the Chakrabarti Report Launch) I hear Jeremy Corbyn dealing with what Wadsworth has said. He is dealing with it calmly, no dramatics. This is what I expect from politicians, rationality. I am too often disappointed. ‘How dare you? How absolutely dare you?’ shouts Smeeth Is that what we should expect from those who have the privilege to represent us? Yes Wadsworth is clumsy, but Smeeth is cruel. When she shouts ‘how dare you’ and walks out it no longer matters what Wadsworth has said, what he alleges, Smeeth has changed the nature of the interaction argument to intimidation. How dare he challenge her? To challenge authority and privilege is indeed an act of daring. Observe this carefully, observe where power lies and ask who is being victimised. Marc Wadsworth has been expelled from the party, not for the antisemitism that he had been accused of but for ‘bring the party into disrepute’. It is not however Wadsworth who has brought the party into disrepute it is Smeeth. To my eyes it is Smeeth but I suppose my eyes do not matter. Ken Livingstone has been in the news again. The fuss over a remark he made two years ago continues. It seems to me that Ken made a daft and irrelevant remark that was not dismissed as a daft remark but was immediately attacked as heresy. I find the reaction a lot more scarily fascistic than anything Ken said ..
Where there is free speech there are going to things said that offend others. Sometimes this will be understandable and we will take other people’s being offended or hurt into account, at other times we will explain why what we have said is important to us. 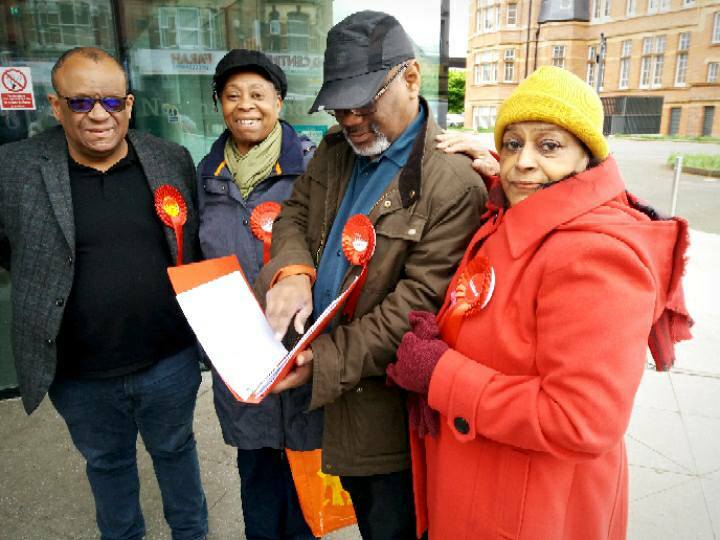 The picture is of me as ward secretary with three councillors, Jenny Bailey, Omana Gangadharan and Lester Hudson, representing my ward in Newham. It’s safe to say that Newham is a safe Labour borough but we campaigned actively winning all 60 seats and getting our new mayoral candidate Rokhsana Fiaz elected as Mayor. I freely admit that I do not know much about the intricacies of national and party politics and so I was initially puzzled that some Labour supporters were disappointed by the overall results of the local elections in which Labour was well ahead in the number of seats gained. But I understand now that only 150 out of 405 councils held elections this year and a map of those councils shows a sea of blue with a few islands of red. It was this support boosted in the May 2017 local elections that made Theresa May miscalculate the odds of smashing Labour in the June 2018 general elections. With a total of 20,209 councillors, an increase by 77 is a drop in the ocean. Nevertheless given the mobilisation of the MSM and establishment against the Corbyn project a hold is a creditable performance. There is a lot of work to do if the Corbyn project is to succeed and given the orientation of the MSM much of this work has to involve very deep conversation that challenges political and ethical assumptions. I’m not feeling good today, about myself or my part of the world. Last night I attended the AGM of the East Ham CLP (Constituency Labour Party). My first, as I was elected secretary of my ward just two weeks ago. We were presented with a short agenda and a list of nominees to be officers and delegates. 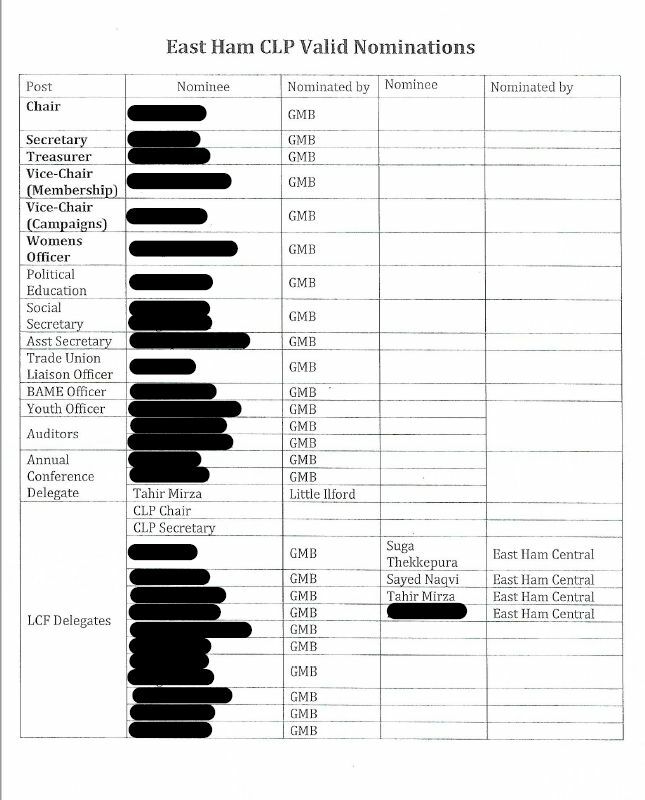 Apparently there had been nominations from the 10 constituency wards that had been presented but were considered invalid so, with 5 exceptions, the list consisted of nominations from branches the GMB union affiliated to the CLP. Challenges were made and questions asked, through points of order, concerning the legitimacy of the proceedings including the status of the Chair and other officers as delegates. These questions were brushed aside in a meeting that became increasingly tense as the challengers persisted. An explosive moment came when one challenger was asked by the chair if he wanted the CLP to become like than of Tower Hamlets. The challenger asked if he was being asked that question because he was Asian. He was promptly shouted at by others in the meeting and was asked to withdraw the remark. He did this but tried to continue with his objections. The Chair at the suggestion of the Mayor ruled that the meeting should move immediately to elections. There was a vote on this by show of hands where only those in favour were asked to show their hands. There was no count of hands and looking around the room it was unclear to me whether more than half the room had their hands up but the motion was passed, albeit to loud objections. The Chair then said that only those nominees on the printed list would be standing for election and that there could be no nominations added from the floor. There were objections to this and the meeting was becoming increasing angry. The Chair went through the list and confirmed nominations unchallenged. I don’t know what happened with the four LCF (Local Campaign Forum) positions where more than one candidate was listed as the meeting was very noisy and my anger was bubbling over. It was at around this point that I walked out of the meeting shouting my objections that this was undemocratic and the people sitting and approving it should be ashamed of themselves. When I am in the throes of ‘righteous anger’ my voice projects well so what I said will have been heard. I am mostly perceived as calm but outrageously unfair and bullying behaviour sends me up the wall and over the edge. But there is nothing righteous about anger even though my perception and position may be clear and correct. Ends do not justify means and angry old men do not look good. I cannot wholly regret my outburst but I will not repeat it as it does me no good and is bad in principle. If it becomes necessary I will withdraw rather than become enraged. After leaving the meeting I went to a local pub with other ‘dissidents’. Even those who were much more experienced that me said that it was the worst meeting that they had been to. It was utterly clear that candidates supportive of the standing regime had been railroaded through. It is clear too that the process by which this happened is unsupportable. This should be obvious simply from the list of nominees almost entirely nominated from the (unnamed) branches of a single trade union. That list should be all that is needed to mark the whole proceedings as undemocratic, unfair and illegitimate. I am grateful to have received very supportive comments from many people on this.